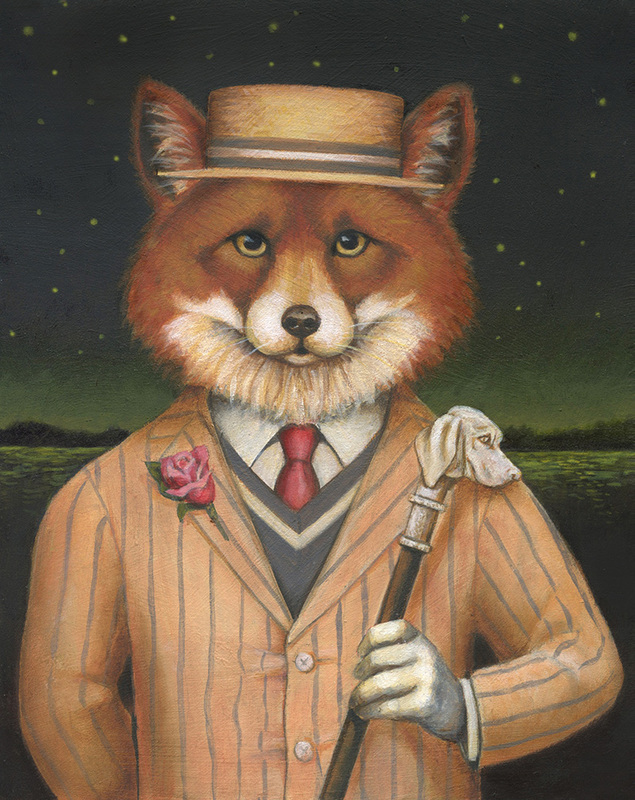 The newest addition to my Fox Dandy series is the Great Gatsby Fox, created for the newest line of rosé wines from Fox Hollow Vineyards in NJ. Inspired by the Jazz Age, an era that gave us bathtub gin, flappers and the Charleston, we pictured our fox right in the middle of it all sipping bubbly at a starlight lawn party on the North Fork of Long Island. I really enjoyed imagining how he would be dressed in the 1920's and decided a linen jacket and straw boater hat were perfect plus the dog headed cane was a final whimsical touch . 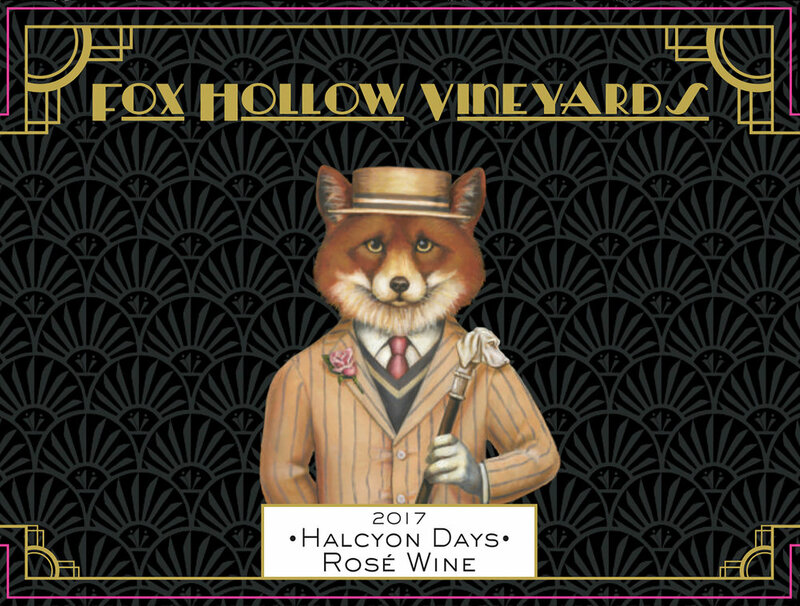 For the new rosé label, Joe Casola, the owner of Fox Hollow Vineyards, wanted to keep the original mascot fox we created for the red and white wines but give him an Art Deco feel which developed into the Great Gatsby theme. I designed a simple fan pattern for the background of the label which we kept dark to offset the gold metallic lettering and border. Joe continued the Jazz Age theme by naming his wines Charleston, Bees Knees, Deco Rose, Pink Flamingo and Halcyon Days. I recently had the pleasure of attending a rosé wine tasting at the vineyard and was surprised to taste all the subtle nuances that different grapes and processing create. Chilled, these wines are the perfect crisp, refreshing drink on a hot summer evening. 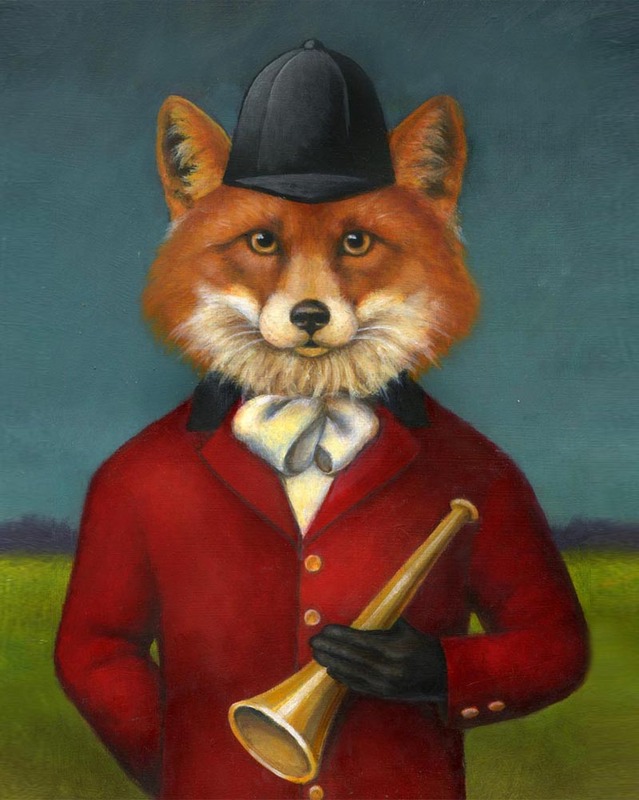 The original fox portrait was done with a fox hunting theme in which the fox turns the tradition upside down by donning the red coat and carrying the horn. I designed the background pattern to continue the fox hunt idea which we also printed as fabric for tablecloths and napkins in he winery. The Spiritualist Fox was the first fox portrait I painted for my shop Curious Portraits and was the inspiration for Joe to have me create the character for his brand.